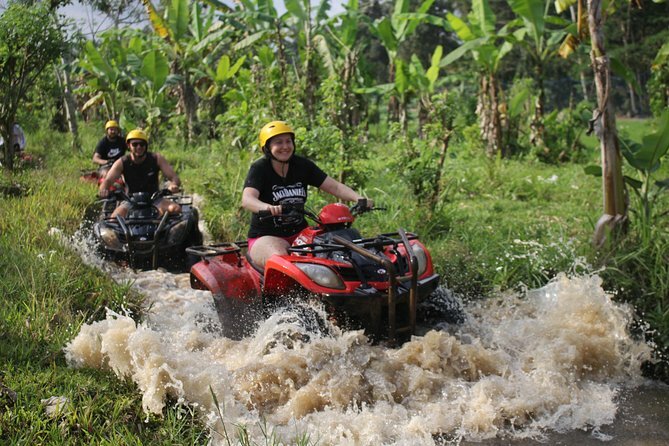 Enjoy a full day of full adventure by quad bike and try out the challenging track to get your adrenaline pumping. The journey continues by paddling on the beautiful Ayung River Ubud. This trip is perfect for the adventurer who loves outdoor activities. We had an amazing well organised day from pickup to drop off. The off roading was fantastic and the muddy track made it even better!! Where socks for inside the wellies and clothes you don't mind throwing away as the mud ruined our clothes but it was worth it. We had such a great day on this trip! We werent sure what to expect, what the standard or what the quality would be like but it exceeded our expectations. The pick up was punctual and we had a safe drive to the ATV place where we were welcomed with a cool drink. We received insurance forms which was a a surprise before being taken in a small group to the bikes. The route was so picturesque through paddy fields and jungle. We saw frogs and birds and butterflies plus locals going about their daily lives. At the end of the session, we had access to clean towels and showers because believe me.. you do get muddy. I had to tip the water out of my wellies provided by the venue! This was followed by lunch which was delicious with no after effects! We were then transported to the white water rafting where again we received a great service. Our guide was friendly, with great English and clearly an experienced canoeist. The trip was fun, very safe and I never felt we were in any danger. The route is beautiful and that in itself is wondeful. The only thing I would point out is that there are a significant number of steps at the end of the white water rafting which were a challenge to me and many others but definitively worth it. Once again we had access to towels and showers and felt very well looked after. We were offered another meal but were still adequately full form the previous one. Would I recommend this trip, Yep and I am about to book it again for our return trip. Its great fin and value for money. Lots of fun! Definitely active! The quad bikes are high level energy and not for for the whimpy! We loved it! Had a great day out and will definitely not be disappointed. Took some amazing pictures while rafting under waterfalls and along the river and even in the rice fields on the quad bikes. Just be prepared for the many steps to the river and on return. Well worth it !!!!!! We did the white water rafting in the morning and the quad bikes in the afternoon as they were expecting rain - which never arrived thankfully. Both adventures were great fun, organised well and we certainly felt like we'd had a work out the next day! Beware of the 400 steps down to the river not for the faint-hearted or infirm and the 350 steps back up again. It was lots of fun!!!!!! Great day out. Totally satisfying, wont disappoint. Half day W.W Rafting enjoyable and lots of fun. Quad Biking fantastic!!. Just my partner and myself with guide. Had lots of obstacle paths and deep water pot holes, paths through rice fields, forrests and a great guide.